BBQ Ribs of Lamb is healthy and tasty food we enjoy when we eat it. Friends must try this recipe. First of all chop garlic, basil and parsley.Squeeze the lemon. Mix the garlic mixture, parsley, lemon juice and all other ingredients to make a delicious marinade! Brush lamb chops with this marinade and let sit one hour in the refrigerator. Time being what it is and we connected our electric barbecue! 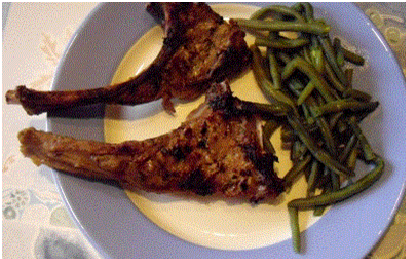 I accompanied the lamb chops green beans steamed. Now our recipe is ready and serves.